Grace Kelly was widely considered the epitome of female poise and class in the 1950's and her marriage to Prince Ranier III of Monaco was the sensation of 1956. A top billed film star, Kelly starred a slew of now classic films including Mogambo with Clark Gable, High Noon with Gary Cooper, To Catch a Thief with Cary Grant and Alfred Hitchcock's Rear Window with James Stewart. She retired from acting in 1956 when she married and became the Princess of Monaco. Grace Kelly's wedding gown has become iconic. It's simple modest lines reflected the demure sophistication of the star's image. The original gown was designed by Helen Rose, the costume designer for MGM and was presented as a wedding gift from the studio. The gown bodice was made from antique Valenciennes rose point lace and the skirt contained twenty-five yards of silk taffeta. Veil and train were made of ninety eight yards of tulle and covered with appliquéd lace lovebirds and thousands of seed pearls. # W104 This simple gown is influenced by Grace Kelly's original gown. 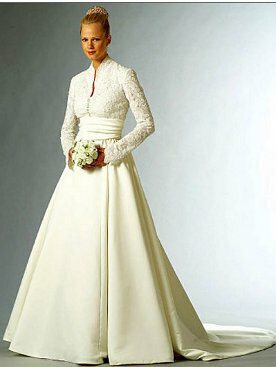 The high necklined bodice and long sleeves are covered with lace. Bodice front is fastened with buttons, back closure is zippered. Full skirt has rear train. Waistline is tied with a sash.